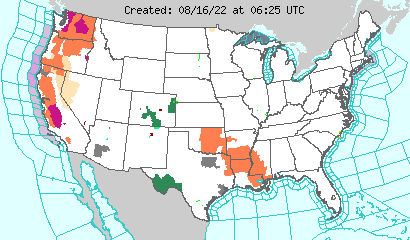 Rain from Coast to Coast today. Hot weather forecast. It will be about 107-degrees in Boise today, and near that in Medford, OR, and may touch on 100-degrees in Dallas/Fort Worth. 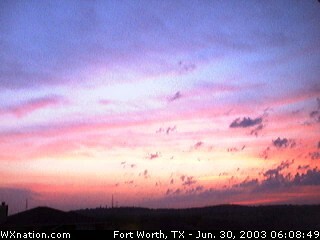 Check the WXnation Fort Worth temp cam to see if it happens. Storms are in the forecast for some today. Here’s today’s forecast story. One killed in severe thunderstorm that swept through Memphis this morning. Storms leave damage in three other states. Also check out FOXNews.com coverage. Severe weather also hits eastern Iowa. Also, storms knock out power in Detroit. Meanwhile, Tropical Depression #6 could become Erika. Another 100 degree day is in store for Dallas/Fort Worth. Yesterday, it was 100 degrees here. 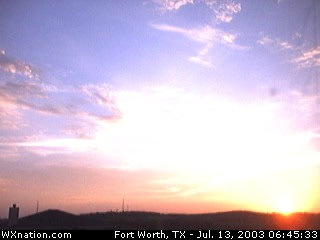 Monitor its progress today at the WXnation webcam and temp cam page. Could be another 100-degree day in north Texas. Those in the Dallas-Fort Worth area can check out the WXnation temp cam to see if it will happen… It was showing 91.8 degrees at 11:30 a.m.
Have Dish Network, and the WB superstations, including WB2 in Denver? Then you know that she does it all! It’s getting hot in the plains. Details in the Friday forecast story from USAToday.com. A green glow in the night sky never looked so good! That shot from the SpaceWeather.com Aurora Gallery for July.